This year marks 35 years since the first bone marrow transplant (BMT) in Cardiff. Celebrating BMT anniversaries and reuniting with patients and their families and colleagues is a highlight for staff and patients and families. It shows what has been accomplished during this time, the difference it has made to people’s lives and how BMT has changed and looking to the future recognising challenges that lie ahead. A series of posters have been designed and put up on the unit depicting the history of Stem Cell Transplantation in Cardiff. 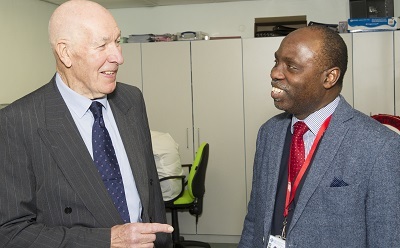 Dr Jack Whittaker, retired Consultant Haematologist, came along to view the posters together with Professor Chris Fegan, Consultant Haematologist, who back in 1986 was a Haematology Registrar in BMT unit, along with ex-patient Pete Constable, plus a few ex-BMTU nurses from that era. Dr Whittaker carried out that first BMT operation and played an important role in the campaign to set up the unit in 1986, said only four operations were done during that first year but now over 150 people receive that care every year. Pete was one of the first patients to undergo BMT in the purpose-built BMTU back in 1986. A photograph of Pete together with Louise Humphreys, who was a nurse in BMTU, is on one of the posters showing the laminar air flow room of the original unit in the early years when first opened. Dr Keith Wilson, Clinical Director of the South Wales Blood and Marrow Transplant Programme and Miriam Atkinson, Staff Nurse B4 Haematology ward (who developed the posters), led the group to view the posters which are on the transplant side of B4 Haematology ward. The posters are of great interest to not only staff and students but also patients and their families who are currently undergoing Stem Cell Transplantation. The first poster shows how Dr Jack Whittaker played an important role in the campaign together with patients and families to develop the purpose-built unit which opened in October 1986. Prior to this, patients initially had to travel to Hammersmith, London and were placed at the end of an existing waiting list, with the risk of relapsing before they were able to receive a BMT. This situation clearly could not continue. From 1983-1986 a few patients received their transplants in a cubicle in intensive care at the University Hospital of Wales. Less than 20 people were treated with a BMT prior to the unit opening in 1986. Numbers transplanted steadily increased and currently about 150 transplants a year are performed. 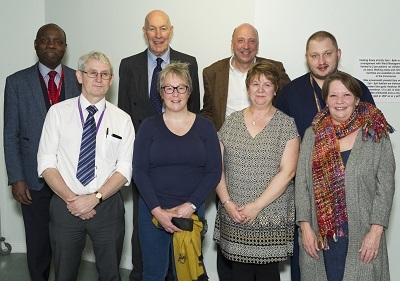 The unit changed the lives of many patients in Wales, who were diagnosed with haematological malignancies and has had a serious and lasting impact.